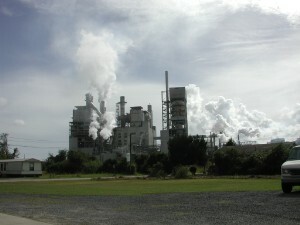 International Paper is the world's largest pulp and paper maker. Paper mill Mondi in Ružomberok, Slovakia. Diagram showing the sections of the Fourdrinier machine. Pressing the sheet removes the water by force. Once the water is forced from the sheet, a special kind of felt, which is not to be confused with the traditional one, is used to collect the water. Whereas, when making paper by hand, a blotter sheet is used instead. Drying involves using air or heat to remove water from the paper sheets. In the earliest days of paper making, this was done by hanging the sheets like laundry. In more modern times, various forms of heated drying mechanisms are used. On the paper machine, the most common is the steam heated can dryer. The commercial planting of domesticated mulberry trees to make pulp for papermaking is attested as early as the 6th century. Due to advances in printing technology, the Chinese paper industry continued to grow under the Song dynasty to meet the rising demand for printed books. Demand for paper was also stimulated by the Song government, which needed a large supply of paper for printing paper money and exchange certificates. The first mechanised paper machine was installed at Frogmore Paper Mill, Apsley, Hertfordshire in 1803, followed by another in 1804. The site operates currently as a museum. The pulp and paper industry has been criticized by environmental groups like the Natural Resources Defense Council for unsustainable deforestation and clearcutting of old-growth forest. The industry trend is to expand globally to countries like Russia, China and Indonesia with low wages and low environmental oversight. According to Greenpeace, farmers in Central America illegally rip up vast tracts of native forest for cattle and soybean production without any consequences, and companies who buy timber from private land owners contribute to massive deforestation of the Amazon Rainforest. On the other hand, the situation is quite different where forest growth has been on the increase for a number of years. It is estimated for instance that since 1990 forests have grown in Europe by a size equivalent to that of Switzerland (44,160 KM) which has been supported through the practice of sustainable forest management by the industry. In Sweden, for every tree that is felled, two are planted. The industry is dominated by North American (United States and Canada), northern European (Finland, Sweden, and North-West Russia) and East Asian countries (such as East Siberian Russia, China, Japan, and South Korea). Australasia and Brazil also have significant pulp and paper enterprises. The industry also has a significant presence in a number of European countries including Germany, Portugal, Italy, the Netherlands and Poland. The United States had been the world's leading producer of paper until it was overtaken by China in 2009. ^ "The Paper Trail at Frogmore Mill". Apsley Paper Trail charity. Retrieved 2 February 2017. ^ "NRDC: Paper Industry Laying Waste to North American Forests". www.nrdc.org. Retrieved 19 February 2016. ^ "A crumpling paper industry". Oregon Local News. Retrieved 19 February 2016. ^ "Amazon draught speeds up destruction The WE News Archives". www.thewe.cc. Retrieved 19 February 2016. ^ Phillips, Tom (20 May 2011). "Brazil forms 'crisis cabinet' following unexpected deforestation surge". The Guardian. ISSN 0261-3077. Retrieved 19 February 2016. ^ De Sisti, Mike (12 December 2012). "China's Paper Operation". Pulitzer Center on Crisis Reporting. Retrieved 13 April 2013. ^ "Japan in the World (according to the figure in Annual Review of Global Pulp and Paper Statistics by RISI)" (in Japanese). Japan Paper Association. Retrieved 15 November 2012. ^ "The PPI Top 100". RISI. Retrieved 2 February 2017. ^ "Global Forest, Paper & Packaging Industry Survey: 2009 Edition - Survey of 2008 Results" (pdf). PricewaterhouseCoopers. p. 12. Retrieved 24 February 2011.